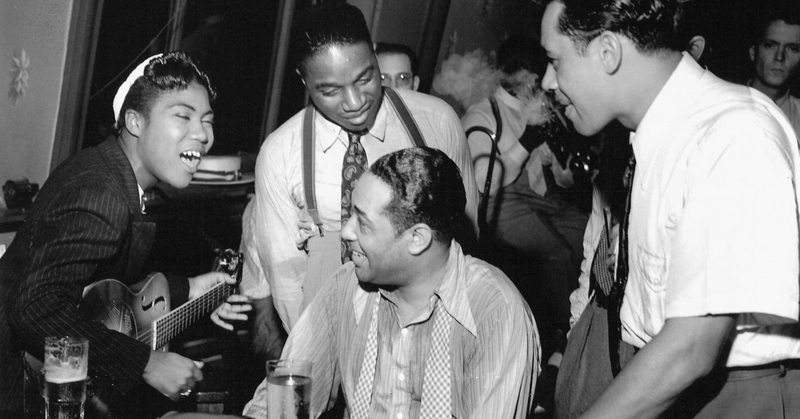 Sister Rosetta Tharpe with Duke Ellington (at piano) and Cab Calloway, with trombonist J.C. Higginbotham ad trumpeter Hot Lips Page looking over the Duke’s shoulder, taken in 1939. Photo: Charles Peterson. President Jimmy Carter decreed that June would be the month of black music on June 7, 1979. In 2009, the commemoration was given the name African-American Music Appreciation Month by President Barack Obama. In his 2016 proclamation, he noted that African-American music and musicians have helped the country “to dance, to express our faith through song, to march against injustice, and to defend our country’s enduring promise of freedom and opportunity for all. ” Here are 15 songs from American Masters you must listen to, to celebrate African-American Music. “Hello Dolly” is the title song of the popular 1964 musical of the same name, originally recorded by Carol Channing. However, it is Louis Armstrong’s version that was the 1965 Grammy Award winner for Song of the Year and was inducted into the Grammy Hall of Fame (2001). “As I always said, if people wanted to know who James Brown is, all they have to do is listen to my music.” If that’s the case then it’s safe to say James Brown feels good! Released in 1965, amid so much racial turmoil in America, it was revolutionary to assert that as a Black man you feel good. “I Got You” went on to be Brown’s biggest hit and is arguably his most popular song. What’s Christmas without Nat King Cole? Recorded in 1946, “The Christmas Song” began Cole’s evolution into a sentimental singer. At that point in his career, Cole was just beginning to crossover and this song had a lot to do with that. The original recording was inducted into the Grammy Hall of Fame in 1974. As Sam Cooke’s debut single, “You Send Me” (1957) introduced the world to the talented singer/songwriter and had a massive commercial success. It was a number one hit on both Billboard‘s Rhythm & Blues Records chart and the Billboard Hot 100. It also made Cooke the first African-American artist to reach #1 on both the R&B and the pop charts. “Dream a Little Dream of Me” is a song from circa 1931, with music by Fabian Andre and Wilbur Schwandt and lyrics by Gus Kahn. But chances are if you heard it, it was sang by Ella Fitzgerald. “I’m very shy, and I shy away from people,” Ella Fitzgerald once said. “But the moment I hit the stage, it’s a different feeling. I get nerve from somewhere; maybe it’s because it’s something I love to do.” More than anything, it is this love of performing that won her the hearts of millions throughout the world. Being the “Queen of Soul” and one of the best-selling female artists of all time, Franklin has cemented herself in the American music canon with her songs “Respect,” “Think,” “Chain of Fools,” “Freeway of Love,” to name a few. But, Respect (which celebrates its 50th anniversary this year) was groundbreaking. The Experience’s first single, “Hey Joe,” spent 10 weeks on the UK charts, topping out at spot No. 6 in early 1967. The debut single was quickly followed by the release of a full-length album Are You Experienced, a psychedelic musical compilation featuring anthems of a generation. Are You Experienced has remained one of the most popular rock albums of all time, featuring tracks like “Purple Haze,” “The Wind Cries Mary,” “Foxey Lady,” “Fire,” and “Are You Experienced?” It also launched the short, but legendary career of Jimi Hendrix. With her song “Strange Fruit,” Billie Holiday found her real audience. A deeply powerful song about lynching, “Strange Fruit” was a revelation in its disturbing and emotional condemnation of racism. Proof that Holiday’s voice could be both quiet and strong at the same time. In 1944 Sister Rosetta Tharpe released “Strange Things Happening Every Day,” It was the first gospel record to cross over, hitting no. 2 on the Billboard “race records” chart, the term then used for what later became the R&B chart. The recording has been cited as precursor of rock and roll. “Tenderly” was published in 1946 with music by Walter Gross and lyrics by Jack Lawrence. Through the years it became a jazz standard, but no could sing it quite like The Divine One, Sarah Vaughan. She was also the first artist to record the hit single, something she was allegedly very proud of.